The MobileVitals Classic system gives patients access to personal emergency response services plus the benefits of monitoring important aspects of their health. RPM Program Support: MobileHelp has built an ecosystem of services that support RPM programs of all sizes – from small clinical settings to large-scale health networks. Clinical oversight, patient triage, reporting, inventory management and door-to-door shipping logistics are available to support healthcare organizations as they implement or expand RPM programs. 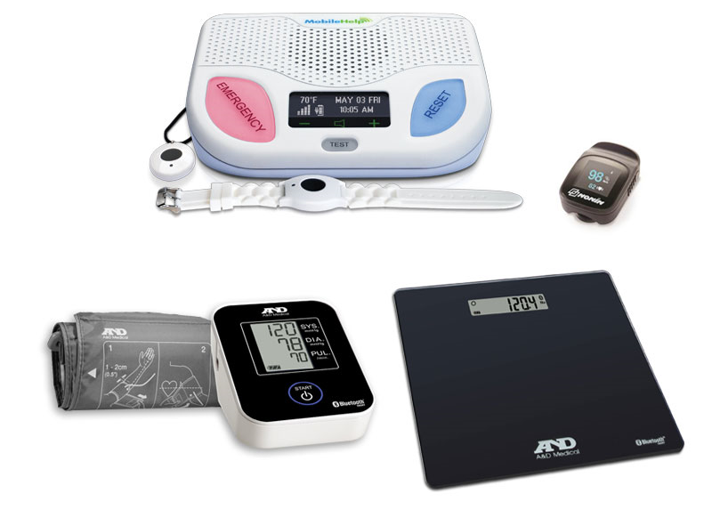 Remote Patient Monitoring: Track vitals remotely using reliable wireless health monitoring devices (blood pressure monitor, pulse oximeter, weight scale and glucose monitoring device). Medication reminders: Allows customers along with their authorized caregivers or family members to manage their medications, with the capability to add new prescription information, set and change medication schedules, and push out a medication reminder alert. Emergency Response: Help is just a button press away – 24/7/365 emergency monitoring. Our trained, US-based emergency response operators will know who you are and dispatch appropriate help. Fall Button™/Activity tracking: The optional MobileHelp Fall Button automatically detects falls*, and also allows users to track activity levels on a daily, weekly, monthly and even yearly basis. Tracking activity levels side-by-side with vital signs such as weight and blood pressure allows consumers to truly monitor the health-related benefits of increased activity levels. *Fall Button™ does not detect 100% of falls. If able, users should always push their help button when they need assistance. Fall Button is not intended to replace a caregiver for users dealing with serious health issues. MobileHelp® is a registered trademark of MobileHelp®. Patented technology. MobileHelp® is a FDA registered Medical Device Manufacturer.